A complete package that will solve 90% of the heat- related problems the systems designer will experience when working with large systems and enclosures. an extraordinary centrifugal air mover, in an in-line configuration for use within a house OR in a weatherproof enclosure for use outdoors. 8 feet of flexible tubing. a hot air collector that easily mounts to almost any enclosure; the combination is simple, inexpensive, and virtually silent. All necessary clamps, brackets, and instructions are included. The fans � The in-line Energy-Star rated fan will exhaust 140 cubic feet of hot air per minute in free air, while the EXT version (not Energy Star rated) will exhaust 100CFM. With as much as 25' of tubing, either will still move a large volume of heated air-quietly. 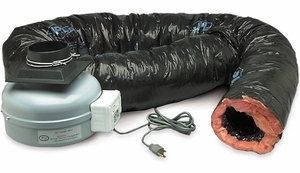 The in-line model is suitable for use indoors, in any position, and is not affected by moisture, dust, or temperatures up to 140� F. Tubing can be connected to both intake and exhaust ports; the fan can push or pull air�or do both! The Exterior model is enclosed in a weatherproof metal case 10"w x 14"h x 5"d. It mounts outside the house and incorporates a one-way "trap door" to prevent outside air, dust, and insects from entering the house. The in-line version is 13" long and 9.5" in diameter at its widest. Both use a Swiss-made, balanced motorized impeller that produces minimal noise and vibration. They consume only 60 watts and are rated for continuous operation; we guarantee the System 1 fans for 3 years. The tubing � The System 1 comes with 8 feet of 4" ID/ 6" OD flexible, acoustically-damped tubing. This diameter allows hot air to move slowly and quietly. Additional lengths are available and will reduce the amount of air moved. The hot air collector � measures 6 �" square at its mounting flange; just screw the collector over a 4 �" opening in the rear or other and slip the tubing on.